Athletes and fitness enthusiasts who are serious about improving often have complex workout routines and need to keep track of their progress. This means memorizing everything or carrying around a notebook and pencil, cellphone, tablet, or other device. Pair this with a handheld stopwatch or wrist watch and an iPod with headphones and you’re left with distractions that impair the quality of a workout. The technology to make this a reality could be invented within 50 years. Today’s fitness trackers range from $50-250 in three main form factors: bracelets, clip-ons, and watches. Some track sleep, and some are sport specific. Because these devices are made to be convenient to wear when working out, they require a companion app on a cellphone or desktop to view advanced data metrics. All of them are battery operated which means they need to be recharged every night or can run up to a few weeks, but need the battery changed after that. 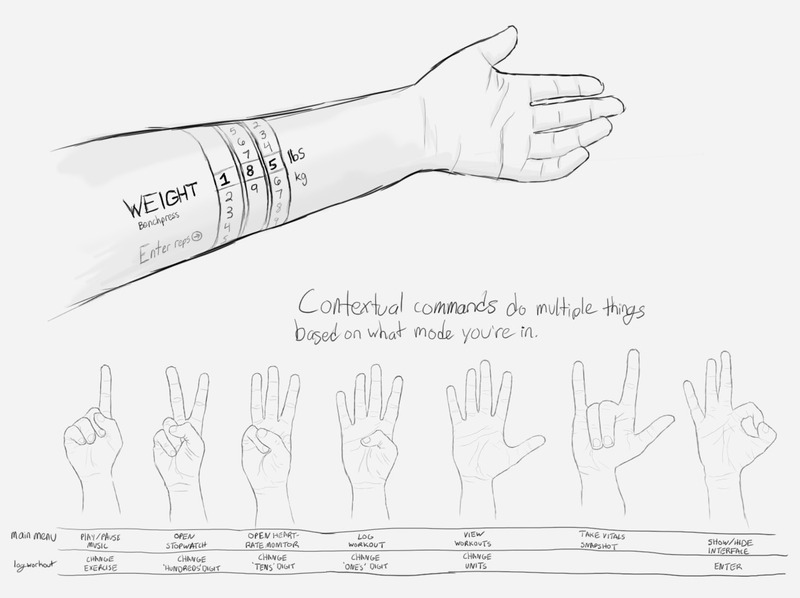 My sketches helped visualize where on the arm the tattoo would be best located for easy interaction and visibility. I also explored some gestured-based controls for hands-free interaction.